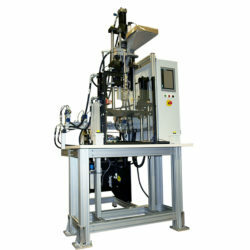 Mini-Jector models 70 and 75 are floor-standing, hydraulic 10-ton injection molding machines ideal for bridge manufacturing or prototype applications. The Model 70 is a vertical injection molding machine using vertical clamp force, while the Model 75 is a horizontal injection molding machine using vertical clamp force. Both reciprocating screw injection molding machines are equipped with Siemens PLC and HMI controls for superior control over molding injection pressure, temperature, screw speed and more. The floor-standing models 70 and 75 provide 1 or 2 ounce injection sizes, making them suitable for molding small or large parts. 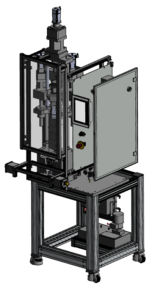 Requiring only 11 sq ft and 20 sq ft of floor space for the model 75 and 70, respectively, these machines provide superior injection molding flexibility that is ideally integrated into product assembly lines. With a durable design that is easy to maintain, the Model 70 and 75 are valuable assets to the prototype, initial production, bridge production, and additional production stages. What Can the Model 70 and 75 Do? Mini-Jector machines use mechanical advantage to generate a substantial vertical clamping force. 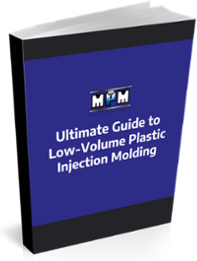 This force is maintained through the vertical injection molding cycle (for the Model 70) or horizontal injection molding cycle (for the Model 75). . The Mini-Jector Models 70 and 75 are larger than the previous model, with the ability to run small or large parts. These models are also designed with intuitive controls and easy maintenance, so they can easily be integrated into your existing factory processes. Based on these and other innovative design elements, the Mini-Jector allows you to affordably adapt prototypes as needed, without the expense of a full-scale mold. You can also meet demand requirements more easily with the flexibility provided by an additional injection molding machine. Do You Have a Question About the Model 70 and 75 Product Specifications or Capabilities? Contact Us!